Hear the Doom pedal on the new Jamiroquai album being used by Paul Turner. 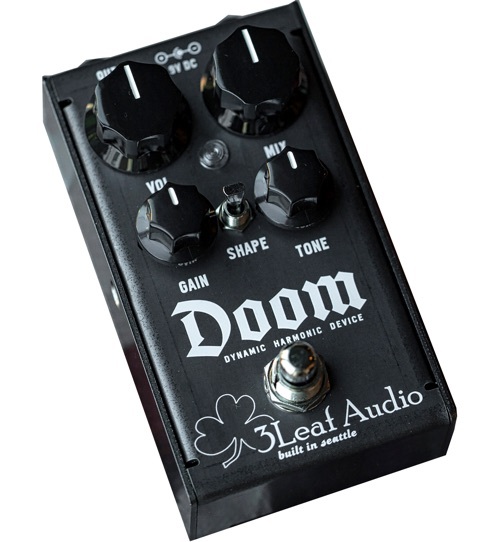 The Doom turns the idea of a fuzz pedal on its head. It responds to your playing dynamics to generate vintage synth-inspired sounds. Strong upper octave harmonics add depth without the need of additional stompboxes, although You're Doom will also interact beautifully with the rest of your pedalboard. You're Doom works well on all instruments, thanks to its full frequency range output. The shape control switches between a powerful lead sound and a broad mid scoop, while the tone knob works just like a synthesizer's cutoff control to alter the high frequency content. It is finished in raw hot-rolled steel for a beautifully brutal look and features the relay-based true bypass system used in all 3Leaf Audio stompboxes.